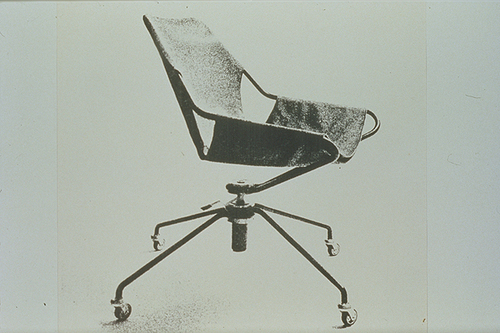 I love this elegantly minimalistic task chair designed by brazilian modern master paulo mendes da rocha. A sling based chair, it has a wonderful essential quality, from the tall spider base, to the cantilevered tube frame for the sling. Not sure that it was ever manufactured, but it was a part of a seating line that included a stationary chair and a chaise lounge. If only I didn't spend so many hours of the day in a task chair! But I cannot think of any chair that would work better in a sort of Brutalist type house or office (incl. anything by LeCorbusier). Emotionally, I kind of like it for the same reason I like the eames aluminum group chairs. in the sense they are both very refined in terms of proportion and "rightness" of the design, but you can still sense the raw edges of the production process. Didn't DWR used to sell the lounge chair version? I have to agree with you - this reminds me of the Corbu task chair with the round pad and the semi-circular back pad/arms. The chair is a completely different form, but it has that same stripped down look, tube steel and castors. I could convince myself that I saw this chair in the background of one of those black and white photos of a corbu interior from the thirties! I was right, DWR sells the lounge chair version with a leather or cotton cover.